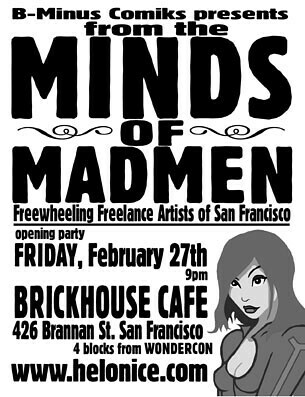 MINDS OF MADMEN ARTSHOW, originally uploaded by MsMonster. Attn Wondercon Attendees! Get your comic drinkie on ! for Comic Art by the creators of Ms. Monster, Hel on Ice & Space Planetary Base Awesome! 9PM - Happy Hour all night long.